Our team of volunteers are invaluable and we are always looking to welcome new people to our enthusiastic and supportive team of volunteers. So, if you have any spare time, read on to see how you can get involved in supporting JET. JET Volunteers do something different: they inspire, motivate and help change young lives. You too can #JETinvolved and help us reach out to 10,000 young people every year. SPEAKING ENGAGEMENTS – help us to spread the word of the work carried out by the JET team. Please get in touch if you have public speaking skills and would be willing to speak on JET’s behalf in your local community. 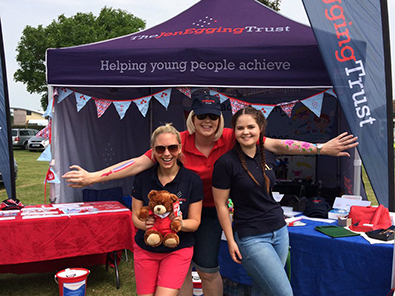 HELPING AND REPRESENTING JET AT EVENTS –Members of the JET team attend various events across the UK each year, from Air Shows to carnivals and fetes, which all help raise awareness of the work we do and assist in raising essential funds. It is not possible to attend many of these events without the support of a loyal team of volunteers who help to set up our stand, talk to supporters and help with the sale of merchandise. COLLECTION BOX CO-ORDINATOR– JET’S Collection Boxes are placed in pubs, clubs, shops and hotels to help raise awareness of JET. If you are able to travel, we would be thrilled for you to join the team to help co-ordinate existing boxes which are placed, but also source new premises to place a box. 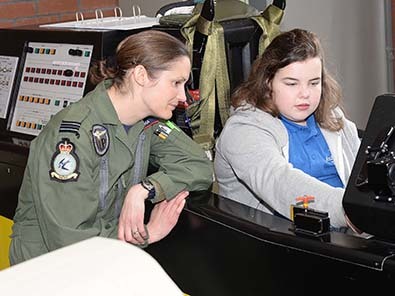 Our inspirational volunteers come from a variety of backgrounds, many are connected to the worlds of aviation, engineering and science. We welcome volunteers from local communities and business to support on our Youth programmes teaching teamwork, leadership and work skills. If you think you have got what it takes to become one of our Inspirational Mentors, download an application form below. Across the country our military partners are integral to the work we undertake. Personnel support young people on our Blue Skies or Inspirational Outreach programmes as well as volunteering on Fundraising Committees to support the work in their area. If you are currently in the military and would like to volunteer please download the application or contact us for more information (see below). Do you have a question about volunteering? Our volunteer team are here to help.